In the Autumn of the year, I hang this sweet welcome sign on my front door. 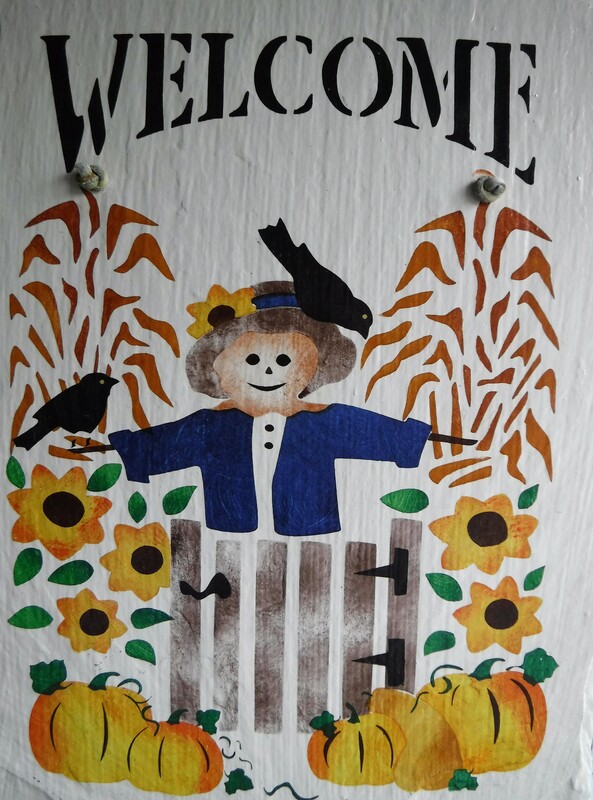 The scarecrow and greeting are painted with acrylics on a heavy piece of slate making the piece very durable. My problem over the years has been the racket the plaque makes by banging to and fro when the door is opened or shut. 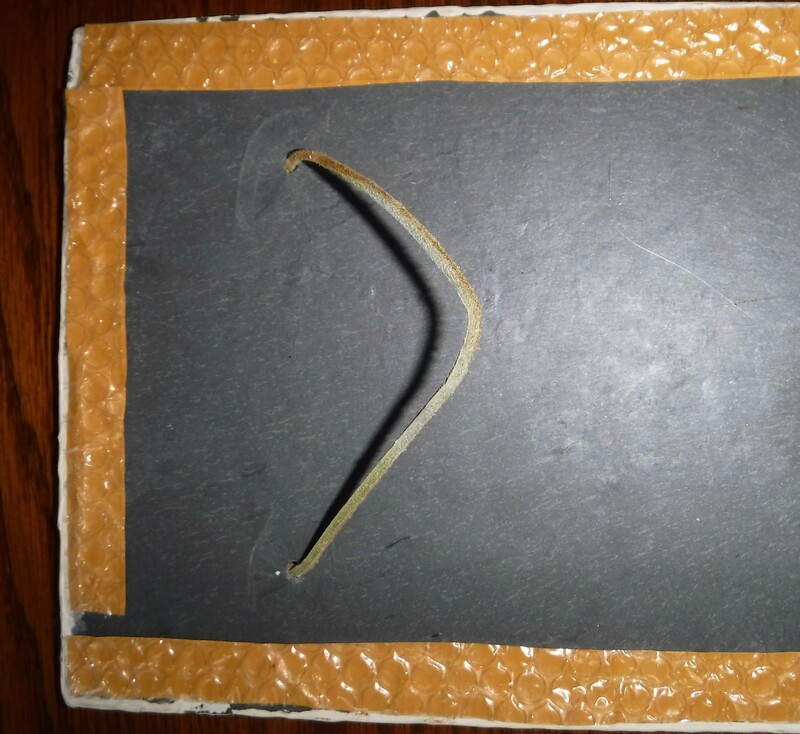 At some point, after years of bouncing around, I’m concerned the slate will crack and be ruined. Bubble wrap to the rescue! 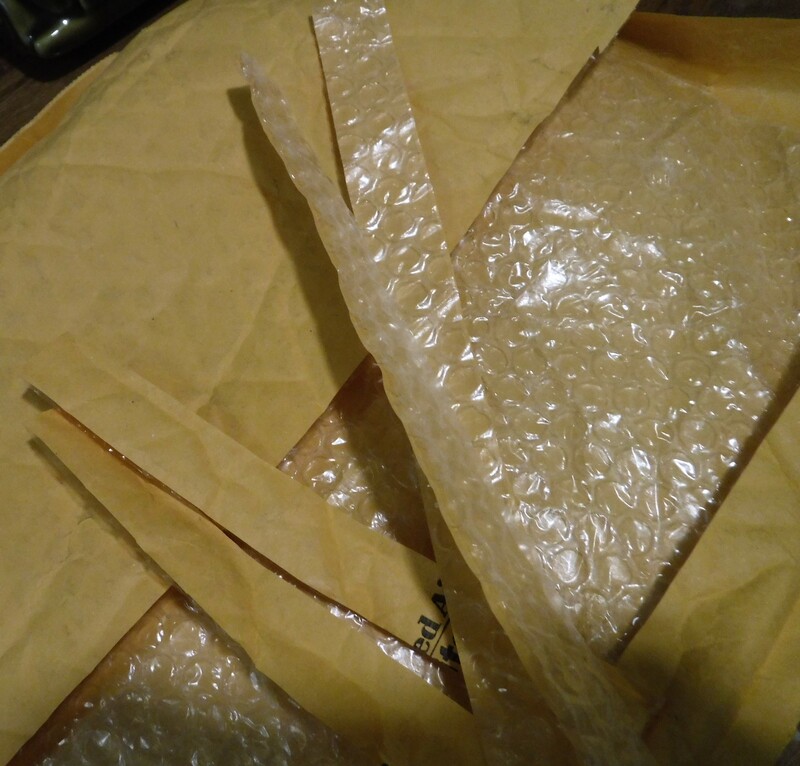 In this age of massive online purchases and mailings, bubble wrap envelopes are abundant. A good way to recycle a few of these is to cut out cushioning strips and put them on the back of items that might be broken by movement. To safeguard the plaque, I cut a few bubble wrap envelope strips and glued them onto the back with my glue gun. The whole process took about five minutes, and the strips work great. The racket is diminished and the plaque is protected. Inspired by my success, I googled recycling bubble wrap. Two of my favorite ideas were found on The Secret Yumiverse: 9 Poppin’ Uses for Bubble Wrap. One was practical: put bubble wrap inside empty handbags/purses to help them keep their shape. The second just made me laugh: make a primitive burglar alarm by putting bubble wrap under the doormat/rugs near your front door. Funny, but hey, it just might work! Photo Challenge – Weather Vane Wednesday/When Pigs Fly! When my kids were little, we gave them bubble wrap for New Year. they had a great time jumping on and popping the noisy bubbles. Bubble wrap is a whole entertainment package in a sheet. What good ideas you have! I must remember the bubble wrap trick! I loved the use of bubble wrap you invented- a noise breaker. Did you post it on Pinterest ? The use of bubble wrap as burglar alarm is really cute. Hopefully some burglar is not tempted to w jump on the plastic and burst the bubbles for fun. He will surely get caught. Thanks Susie. I thought the burglar alarm was so funny. Bubble wrap can be loud when it pops. Wouldn’t it sound almost like someone was shooting at you if you were a burglar. It reminds me of the Home Alone movies. No, I didn’t think to post it on Pinterest. Good idea Susie. Thanks! I think many of your ideas are Pinterest worthy. How to grow avocados from seed ? How to make the buckle cake ? How to grow lettuce from leftover lettuce and so on.